Plastic rubbish that has found its way into the oceans of the world is threatening to destroy the living creatures in the sea, the seabirds that feed on them, and is affecting the health of all land animals that eat the fish and sea creatures. It is a slow ongoing nightmare that has spread around the world. Modern civilization is facing many different extinction threats and the plastics issue is clearly among them. Not only does it involve large pieces of plastic bottles, drinking containers, bags and food wrappers, but the plastic has now broken down into particles so tiny they float around, mixed with the water. 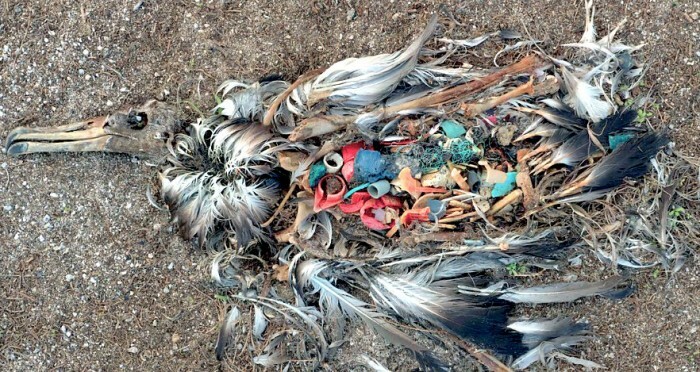 It is the minute pieces of plastic that are being consumed by the fish and the seabirds. And it is killing them. A recent story by Laura Parker in National Geographic quoted from a new study by Australia’s Commonwealth Scientific and Industrial Research Organization, which found that about 90 percent of the seabirds in the world are consuming plastics in their daily diet. When researchers first began tracking plastic ingestion by seabirds in 1960, the ratio of birds found with plastic in their stomachs was less than five percent. By 1980 it had jumped to 80 percent. Now it is at 90 percent and still going up. We can assume that the same thing is happening to the fish and other creatures of the sea that are part of the human diet. This means that anyone eating seafood these days probably has tiny plastic particles, sometimes smaller than a grain of rice, accumulating in the stomach. Since animals are unable to digest plastic, the stuff either gets passed through the digestive system and passed on with natural waste, or it stores up in the body. Chris Wilcox, who lead the Australian study, said plastic found in the birds included bags, bottle caps, synthetic fibers from clothing and those tiny bits broken down by the sun and action of the sea. Once the plastic gets that small it is hard to find, and gets mixed in with everything. Sharp edges in plastic punches holes in the internal organs. Wilcox noted that some seabirds consume so much plastic that there is little room left in the gut for food. It should be no surprise that it is killing off the seabirds. Parker wrote that a recent study found a 67 percent decline in seabird populations throughout the world between 1950 and 2010.